Preheat the oven to 180oC/Gas 4/Fan 165oC. Lightly oil a 900g/2lb loaf tin and line the base with baking parchment. Put the butter, sugar, treacle, syrup and cordial in a medium pan and gently heat, stirring until the butter has melted. Sift the flours, ginger and bicarbonate of soda together into a large bowl. Add the syrup mixture, apple sauce and stem ginger and mix well. Pour into the cake tin and bake for 50 minutes -1 hour. Whip the cream and icing sugar together until it is holding its shape then add the custard and whisk until thick. 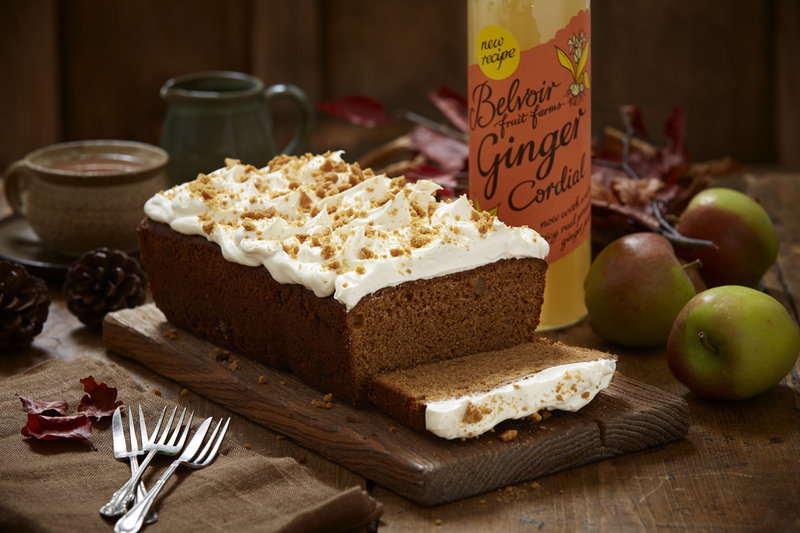 Spread it over the top of the cooled cake and scatter with ginger nuts.